Occupation Russian-American Concert Pianist and Composer; CEO/Founder, Oksana Management Group, Inc.
Oksana Yurievna Kolesnikova, (Pianist Oksana) (born 1978) is a Russian-American composer, concert pianist, entrepreneur and CEO/Founder of Oksana Management Group, Inc., Her primary residence is in Beverly Hills, California. In addition to concerts and television performances, she performed regularly for seven years at the Polo Lounge in The Beverly Hills Hotel from 2006 and recorded several CDs of classical, new age, and popular music including original compositions and collaborations with other international musical artists. She is the owner of Oksana School of Music, which provides in person and online lessons via Skype for voice and other instruments using a network of freelance instructors who fan out across the region, and owner of Oksana School of Foreign Languages. Oksana School of Music was the 2013 winner of the Best of Beverly Hills Business Award. Both businesses are headquartered in Los Angeles, California. A reality television series about Oksana and her students began development in early 2015. 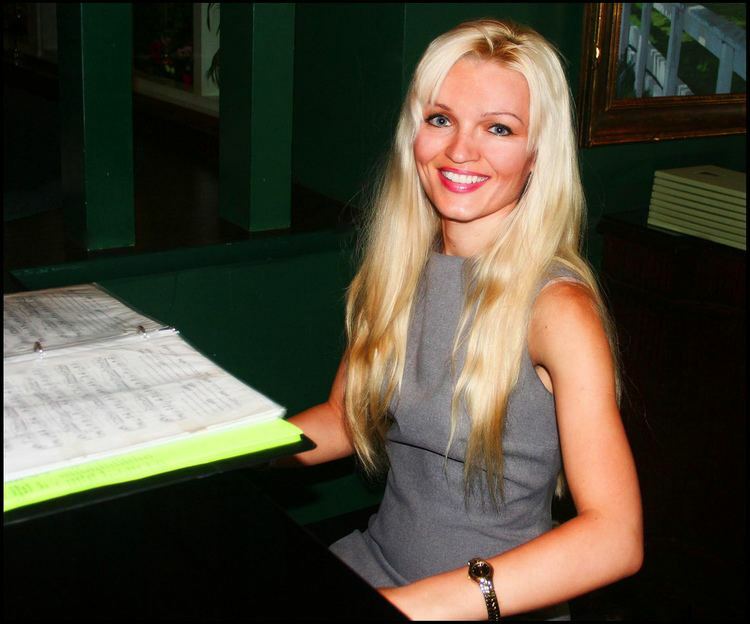 Oksana's celebrity piano students include Grammy award-winner Kenny ‘Babyface’ Edmonds, producer Toby Gad, The Amazing Race TV producers Elise Doganieri and Bertram Van Munster, and Kim Kardashian, among many others. Her performances on YouTube have been viewed more than 1.5 million times on her channel, "Oksanabella." In 2009, her public recognition increased dramatically when she was erroneously identified internationally in the media as the romantic partner of actor and director Mel Gibson. Oksana Kolesnikova was born in Barnaul in Altai Siberia, USSR. She studied classical piano in Russia from the age of five. Following the break-up of the Soviet Union, she immigrated with her family to the United States in 1993 at the age of 15. Her family settled in St. Petersburg, Florida. After entering St. Petersburg College, Kolesnikova won the Florida State Young Artists Symposium Competition in 1999. The award earned her a scholarship to attend Florida State University. She graduated with honors from the School of Music, Florida State University, in August 2001. She received her U.S. Citizenship on January 18, 2006. During her coursework at Florida State University and after graduation, Kolesnikova performed throughout Florida, where she was seen by an executive at HSN (Home Shopping Network). She was asked to perform on the television network and returned regularly, gathering a national following of fans. She was featured on Adrienne Arpel's HSN show. In 2003, Kolesnikova became the first Russian-American female pianist to travel overseas to entertain the U.S. Troops. She made two world tours on behalf of the Morale, Welfare and Recreation Department (MWR) of the U.S. Navy. She made a solo tour to entertain the U.S. Troops in September 2003, stopping in Italy, Spain and Greece. In February 2004, she went to Asia, including stops in Guam, Korea, Japan, Okinawa, and Singapore with Navy MWR. She also was invited to perform for U.N. officials in New York City. Following her tours, she moved to Los Angeles, California. In 2006, Kolesnikova performed at the Salento International Film Festival on opening night. She continues to perform internationally and in the U.S.
From 2006 to 2013, she performed weekly at the legendary Polo Lounge in The Beverly Hills Hotel and continues to be in demand for private and charitable events. She has recorded eight CDs of original, classical and popular music and her own instructional video for students of piano. Her “Free Floating” CD won the “2010 Best Classical Album of the Year” on Solo Piano.com. She has collaborated with other international musical artists for recordings, and her original compositions have been chosen by international artists to record on their own CDs. Her CD, "Best of Two Worlds," evolved from a collaboration with notable fine artist Jim Warren, who created his own art series based on Kolesnikova's compositions. "Oksanabella", Kolesnikova's YouTube channel featuring her performances, has more than one million upload views from all over the world. Oksana opened Oksana School of Music to provide lessons in piano, guitar, violin, drums and voice, among other instruments. She reaches students in the greater Los Angeles region with both in person and online lessons through a roster of instructors. In 2013, her business was awarded the "Best of Beverly Hills Business Award." International media coverage of Kolesnikova includes television appearances on PBS with Scott Houston, “The Piano Guy,” on HSN (Home Shopping Network) as a performer and a business woman, and featured as “Woman of the Week”on CBS Los Angeles. As a musician and teacher, she has been written about in The New York Times and, as a performer and composer, has been featured on the cover of Hollywood Weekly and Imago Magazine, among others. She gained additional, world-wide attention in April 2009 after erroneous but widespread, initial news reports on television, the Internet, and in print identified her as being romantically involved with the married actor and director Mel Gibson . Kolesnikova's striking appearance, high-profile piano performances in Beverly Hills, and regular, close proximity to Gibson and other Hollywood power brokers during lunch meetings at the Polo Lounge led members of the media and press to assume without confirmation that she was Gibson's unidentified girlfriend known only as a musician named "Oksana." The media frenzy that followed created serious publicity and privacy issues for Kolesnikova, who was married to her manager, Alessandro Concas, for nine years and was four months pregnant at the time of the news stories. In March 2015, the media widely carried the announcement of reality television celebrity Kim Kardashian, wife of musician Kanye West, hiring Kolesnikova for piano lessons. Kolesnikova has dedicated much of her time, music, and sales of CDs to charitable causes, including environmental concerns through "Cool Green Fashion for Forests" and children with cleft palate through Smile Train.